Chemotherapy resistance resulting in incomplete pathologic response is associated with high risk of metastasis and early relapse in breast cancer. The aim of this study was to identify and evaluate biomarkers of treatment-resistant tumor cells. We performed a cell surface marker screen in triple-negative breast cancer patient-derived xenograft models treated with standard care genotoxic chemotherapy. Global expression profiling was used to further characterize the identified treatment-resistant subpopulations. High expression of sialyl-glycolipid stage-specific embryonic antigen 4 (SSEA4) was found in residual tumor cells surviving chemotherapy and in samples from metastatic patients who relapsed after neoadjuvant chemotherapy. Gene and microRNA (miRNA) expression profiling linked SSEA4 positivity with a mesenchymal phenotype and a deregulation of drug resistance pathways. Functional assays demonstrated a direct link between epithelial–mesenchymal transition (EMT) and SSEA4 expression. Interestingly, SSEA4 expression, EMT, and drug resistance seemed to be regulated posttranscriptionally. Finally, high expression of CMP-N-acetylneuraminate-β-galactosamide-α-2,3-sialyltransferase 2 (ST3GAL2), the rate-limiting enzyme of SSEA4 synthesis, was found to be associated with poor clinical outcome in breast and ovarian cancer patients treated with chemotherapy. In this study, we identified SSEA4 as highly expressed in a subpopulation of tumor cells resistant to multiple commonly used chemotherapy drugs, as well as ST3GAL2, the rate-limiting enzyme of SSEA4 synthesis, as a predictive marker of poor outcome for breast and ovarian cancer patients undergoing chemotherapy. Both biomarkers and additionally identified regulatory miRNAs may be used to further understand chemoresistance, to stratify patient groups in order to avoid ineffective and painful therapies, and to develop alternative treatment regimens for breast cancer patients. Breast cancer is a heterogeneous disease at molecular and cellular levels. Several subtypes of breast cancer can be defined, depending on molecular marker expression , and disease management is currently tailored according to the molecular characteristics of each subtype. Triple-negative breast cancer (TNBC) and the luminal B subtype are characterized as very aggressive and associated with high risk of early relapse and metastasis [2, 3]. Owing to the lack of defined molecular targets for TNBCs and due to the high proliferative rate of TNBCs and luminal B tumors, chemotherapy remains a first-choice therapeutic option for these two subtypes. In the neoadjuvant setting, the standard options for TNBC are a combination of doxorubicin/cyclophosphamide (AC) or 5-fluorouracil, epirubicin, and cyclophosphamide followed or not by taxane-containing regimens, or a combination of cyclophosphamide, methotrexate, and 5-fluorouracil . The majority of TNBC patients respond initially to neoadjuvant chemotherapy treatment, but only about 20 % reach a pathological complete response, whereas most patients either have lower de novo sensitivity to chemotherapy or develop resistance to chemotherapy . Residual cancer cells persist and initiate tumor recurrence and metastasis within 3 years after chemotherapy in about 40 % of patients . Hence, the development of predictive tests for chemotherapy resistance represents an urgent need that would aid in therapy decision-making. Many studies have been reported that provide data about the molecular basis of human breast cancers. However, the high degree of heterogeneity within the tumor, as well as the varying response to chemotherapy of cellular subclones, makes the interpretation of these molecular profiles difficult . In particular, if biomarkers correlating with treatment outcome are expressed only in subpopulations of tumor cells, the analysis of bulk tumor material might lack sensitivity. Furthermore, tumor cell subpopulations can change their phenotype and gene expression profile to escape chemotherapy by means of epithelial–mesenchymal transition (EMT), upregulation of multidrug resistance transporters, and modulation of key signaling pathways [7, 8]. Thus, it is crucial to analyze marker expression patterns at different time points during chemotherapy, when the tumor cells are either developing drug resistance or de novo resistant subpopulations are selected. In the present study, we performed a flow cytometry–based screen of cell surface markers in patient-derived xenografts (PDXs) of TNBC tumor samples during AC chemotherapy. PDXs exhibit morphology, molecular characteristics, and drug response profiles similar to those of the original patient tumors  and thereby represent a reliable model and a reproducible source for human tumor cells needed for detailed analyses of tumor cell subpopulations over time [9, 10]. We observed that a high percentage of residual tumor cells surviving chemotherapy at surgical ablation express the sialyl-glycolipid stage-specific embryonic antigen 4 (SSEA4). Molecular profiling revealed mesenchymal traits as well as upregulation of genes involved in multidrug resistance in SSEA4-positive compared with SSEA4-negative tumor cell subpopulations. Elevated expression of CMP-N-acetylneuraminate-β-galactosamide-α-2,3-sialyltransferase 2 (ST3GAL2), the enzyme catalyzing the last step of SSEA4 synthesis, is associated with poor prognosis in breast cancers treated with chemotherapy. This predictive value was also confirmed in a cohort of ovarian carcinoma. Thus, we propose SSEA4 as a novel marker for EMT-associated chemotherapy resistance and ST3GAL2 expression as a predictive marker for tumor resistance to chemotherapy. A detailed description of materials and methods can be found in additional file 1. Human breast cancer xenografts (HBCx) were established from patient’s primary tumor surgical specimens by grafting tumor fragments into the interscapular fat pad and maintained through in vivo passages as previously described . All experiments were performed in accordance with French legislation concerning the protection of laboratory animals and in accordance with a currently valid license issued by the French Ministry for Agriculture and Fisheries for experiments on vertebrate animals. The ethics committee was organized according to the pertinent French legislation and was approved by the French Ministry of Research under number CE 51. Primary serous ovarian carcinoma cell lines were established by transplantation of primary tumor specimen or tumor cells directly isolated from ascites or pleural effusion samples. Human tumors were injected intraperitoneally into NOD.Cg-Prkdc scid Il2rg tm1Wjl mice. Engrafted first passage xenografts were dissociated into single cells and maintained under serum-free culture conditions. Animal care and all procedures were carried out according to German legal regulations and were previously approved by the governmental review board of the state of Baden-Wuerttemberg (Regierungspräsidium Karlsruhe authorization number G17/12). This study was performed with human tissue samples obtained from patients admitted to the University Clinic Mannheim Department of Gynecology. The study was approved by the ethics committee of the University of Heidelberg-Mannheim (case number 2011-380N-MA) and conducted in accordance with the Declaration of Helsinki. Written informed consent was obtained from all patients. In addition, primary patient samples of clear cell renal cell carcinoma (RCC) were obtained from the Department of Health Sciences at the University of Milan. All samples were collected according to the regulations for the use of primary material according to “doc. web n. 1878276” (Pubblicato sulla Gazzetta Ufficiale n. 72; 26 Mar 2012). The epithelial breast cell line MCF 10A was purchased from the American Type Culture Collection (ATCC® CRL-10317™; ATCC, Manassas, VA, USA). The HBCx-17 and HBCx-39 cell lines were primary cells derived for the respective HBCx tumors at XenTech SAS (Evry, France). The OC-12, OC-14, OC-15, OC-18, OC-19, and OC-20 cell lines were primary cells derived for the respective ovarian cancer xenograft tumors at HI-STEM gGmbH (Heidelberg, Germany). Doxorubicin (ADRIBLASTINA® RD; Pfizer, New York, NY, USA) and cyclophosphamide (ENDOXAN®; Baxter Healthcare, Deerfield, IL, USA) solutions were administered on the same day via intraperitoneal injection at a dose of 2 mg/kg (doxorubicin) and 100 mg/kg (cyclophosphamide). To obtain a complete response for models HBCx-17 and HBCx-6, the same dose of AC chemotherapy was applied a second time, 3 weeks after the first injection. AC chemotherapy was applied to 68 mice of tumor graft model HBCx-17, 32 mice of HBCx-10, 35 mice of HBCx-6, and 30 mice of HBCx-14 model, not including the control group. Tumor tissue was dissociated into a single-cell suspension using the human Tumor Dissociation Kit in combination with the gentleMACS Octo Dissociator (both from Miltenyi Biotec, Bergisch Gladbach, Germany) according to the manufacturer’s instructions. Cells were stained with the indicated antibodies (Additional file 2: Table S1) according to the manufacturer’s instructions and analyzed using the MACSQuant™ Analyzer (Miltenyi Biotec) (Additional file 3: Figure S1). In the cases of SSEA4, TRA-1-60, and TRA-1-81, recombinant antibodies were available and were used because of their superior characteristics [11, 12]. The specificity of all recombinant antibodies was validated and compared with conventional clones. In the case of SSEA4, identical specificity for antibodies derived from clone MC-813-70 and clone REA101 was proven by cross- blocking experiments, which showed that either antibody specifically blocks binding of the alternative one, suggesting that both antibodies bind the same epitope on the target structure SSEA4 (Additional file 4: Figure S2). SSEA4-positive and SSEA4-negative tumor cell subpopulations were isolated by magnetic activated cell sorting (MACS® Technology; Miltenyi Biotec). After dissociation and depletion of mouse cells using the Mouse Cell Depletion Kit (Miltenyi Biotec), the cells were labeled with SSEA4-phycoerythrin (Miltenyi Biotec) followed by anti-phycoerythrin MicroBeads (Miltenyi Biotec) and separated using MS and LD columns (Miltenyi Biotec). For microarray analysis, cells were pelleted and lysed in QIAzol® (QIAGEN, Hilden, Germany). To induce EMT, the epithelial breast cell line MCF 10A was treated with transforming growth factor (TGF)-β1 (Miltenyi Biotec) at concentrations of 10 and 20 ng/ml. EMT markers such as epithelial cell adhesion molecule (EpCAM), E-cadherin, vimentin, and fibronectin served as indicators of EMT induction efficiency. Messenger RNA (mRNA) and microRNA (miRNA) expression profiling was performed using Agilent microarrays (Agilent Technologies, Santa Clara, CA, USA) according to the manufacturer’s instructions. The mRNA and miRNA data discussed in this publication have been deposited in the National Center for Biotechnology Information Gene Expression Omnibus (GEO) [13, 14] and are accessible under GEO series accession number [GEO:GSE57705] (http://www.ncbi.nlm.nih.gov/geo/query/acc.cgi?acc=GSE57705). To evaluate the prognostic value of candidate genes, the publicly available Kaplan-Meier Plotter (http://kmplot.com/analysis/) was used. The Kaplan-Meier survival plots of the two patient cohorts were compared using log-rank test with hazard ratios (HRs) and 95 % confidence intervals [15, 16]. Cells were seeded in 96-well flat-bottom plates. After 2 days at 37 °C and 5 % CO2, the cells were treated with different standard chemotherapy drugs. To obtain a dose–response curve, each drug was tested at serial concentrations. Cell viability was analyzed 72 h after addition of drugs using the CellTiter-Glo® Luminescent Cell Viability Assay Kit (Promega, Madison, WI, USA) according to the manufacturer’s instructions. Luciferase activity was measured on a luminometer (PerkinElmer® EnVision™; PerkinElmer, Waltham, MA, USA). An antibody screening based on a library of 45 antibodies directed against surface epitopes including published stem cell and/or cancer stem cell markers (Additional file 2: Table S1) was performed to identify novel biomarkers for breast cancer cell subpopulations resistant to chemotherapeutic treatment. For the initial screening, 50–100 xenografted mice were used for each of four independent TNBC PDXs . When tumor volumes reached 150–350 mm3 (pretreatment stage), mice were treated with an AC combination according to the standard of care. After tumor shrinking to volumes of 14–63 mm3, the nodules were removed (residual tumor stage). Tumors from untreated mice were removed (untreated stage) to serve as direct controls. A group of animals with residual tumors were kept until the disease recurred (regrowth stage) (Fig. 1a). All tumors removed at any time point were dissociated and analyzed by flow cytometry. No significant differences concerning marker expression were found between the pretreatment and untreated stages, excluding size-dependent marker regulation, whereas the expression of 10 markers decreased (Fig. 1c) and the expression of 13 markers increased (Fig. 1d) during chemotherapy. Eighty-seven percent (20 of 23) of these markers returned to an expression level similar to the untreated stage upon tumor regrowth (Fig. 1c and d). CD44 and CD133, which have been described to correlate with a cancer stem cell and drug resistance phenotype , showed enrichment in only one of the four models. This is possibly due to the tumor heterogeneity that characterizes patients’ tumors, which was here well recapitulated by the use of PDX models (Fig. 1d). 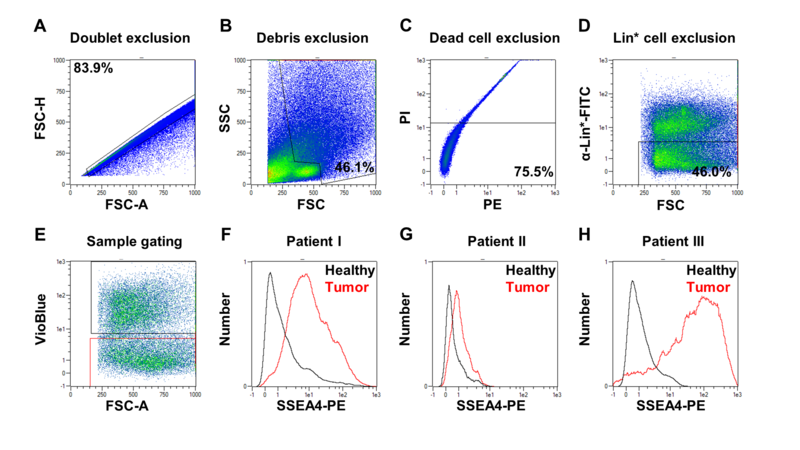 However, we identified a distinct subpopulation of tumor cells expressing SSEA4 that was strongly enriched during chemotherapeutic treatment in all tumor models analyzed. Independent replicates of three tumor models confirmed significant enrichment in the number of SSEA4-positive cells in residual tumors upon AC treatment in all analyzed tumors (p < 0.001, n = 8 for each tumor model) (Fig. 1e). This result was further confirmed by immunohistochemistry (Fig. 1b). Similarly to other markers, the amount of SSEA4-positive cells decreased back to pretreatment levels in three of four tumor models after the treatment was stopped. To further address the correlation between CD24, CD44, and SSEA4 expression, we performed containing of these markers on residual tumor nodules after AC chemotherapy and on untreated tumors of three independent models (Additional file 5: Figure S3). We did not observe a significant enrichment of the CD24low/CD44high subpopulation in any of the models. In model HBCx-6, there was a subpopulation of SSEA4+/CD44+ cells that was enriched by about twofold; however, the SSEA4+/CD44− fraction was enriched to the same degree. In models HBCx-10 and HBCx-14, CD44 and SSEA4 expression was observed on separate subpopulations. We concluded that SSEA4 expression is an indicator of treatment-resistant cells that overcomes the heterogeneity observed for the (cancer) stem cell markers in the tumor models used in this study. In one PDX model, we observed tumors with variable sensitivity to the AC treatment and noticed that the amount of SSEA4-positive cells correlated with these differences. Nineteen tumors showed reduced sensitivity to AC treatment (tumor volume >100 mm3 as maximal regression), and one tumor did not respond to the treatment at all (no tumor shrinkage during treatment). The percentages of SSEA4-positive cells were 36.8 % in sensitive tumors, 42.2 % in tumors with reduced sensitivity, and 98.5 % in the fully resistant tumor (data not shown). Therefore, we compared tumors from PDX models that are sensitive (n = 6) or de novo resistant (n = 4) to AC treatment. Three of four resistant tumor models showed higher percentages of SSEA4-positive cells than the six sensitive tumors (Additional file 6: Figure S4). To provide further evidence of resistance to drug toxicity, we established primary PDX-derived ex vivo cell lines from tumors containing different amounts of SSEA4-positive cells and treated them with chemotherapeutic drugs in vitro. One of the cell lines derived from model HBCx-17 showed reproducible growth as an adherent culture and as a suspension culture, with cells growing in suspension showing higher SSEA4 expression than the adherent cells (Fig. 2a). In cytotoxicity assays with seven commonly used drugs (Fig. 2b-f and data not shown), the suspension cells showed higher half-maximal inhibitory concentration values than the adherent cells for the DNA synthesis and transcription inhibitors cisplatin, mafosfamide, 5-fluorouracil, and doxorubicin, indicating an increased resistance, but not for the topoisomerase inhibitors etoposide, topotecan, and irinotecan. To provide a dose-escalating reproduction of our in vivo experiment, we treated an adherent cell line derived from model HBCx-17, containing about 15 % SSEA4-positive cells in the steady state, and analyzed the phenotype of the cells surviving the treatment upon administration of increasing drug dosages. In every case, the surviving population showed a significantly higher fraction of SSEA4-positive cells (Fig. 2g-i), while the absolute number of SSEA4-positive cells was not significantly increased. Next, we evaluated possible differences in the tumorigenic capacity of SSEA4-positive and SSEA4-negative subpopulations in model HBCx-14, which shows about 10 % SSEA4-positive tumor cells when growing without any treatment and a significant upregulation under genotoxic stress. To do so, 105 freshly dissociated SSEA4-positive or SSEA4-negative cells were injected into two groups of eight mice each. Although a trend toward a faster tumor initiation was observed when we grafted the SSEA4-positive tumor subpopulation, both fractions were able to generate tumors, indicating that the positive fraction only has an initial growth advantage (Additional file 7: Figure S5a). Furthermore, we analyzed the expression of SSEA4 in tumors that arose from both subpopulations. Whereas the fraction of SSEA4-expressing cells in tumors that originated from the SSEA4-negative subpopulation recovered to around 5 %, the one from tumors that originated from the SSEA4-positive subpopulation was reduced to about 10 % following the growth phase in vivo (Additional file 7: Figure S5b). The recovery of the original SSEA4-positive versus SSEA4-negative ratio was also reflected by the observation that when freshly dissociated SSEA4-positive and SSEA4-negative cells were placed in culture separately, they restored the original positive versus negative ratio within approximately 6 days (data not shown), which correlated well with the observation of SSEA4 downregulation during disease relapse after chemotherapy. Local or metastatic breast cancer relapse may occur many years after surgery, despite a short-term response to neoadjuvant chemotherapy  or a failure of adjuvant chemotherapy. To investigate SSEA4 expression in metastatic relapse, we conducted a retrospective case history study using PDXs derived from metastatic specimens. These models were derived from confirmed M1-stage patients through collection of liquid biopsies, either peripheral circulating tumor cells (CTCs) or infiltrating CTCs obtained from serous effusions . Robust SSEA4 expression was exclusively found in PDXs whose donors were previously treated with specific neoadjuvant chemotherapy formulations, including the AC combination and other genotoxic drugs with analogous modes of action, such as epirubicin (Fig. 3). Conversely, metastatic patients who were administered taxols (paclitaxel, docetaxel) or antimetabolites (capecitabine, 5-fluorouracil) as adjuvant therapy, but who had no genotoxic treatment before sample collection (Fig. 3 and Additional file 8: Table S2 for patient history), displayed little or no expression of SSEA4 on their matched PDXs (Fig. 3). We performed microarray-based global mRNA and miRNA expression profiling on SSEA4-positive and SSEA4-negative cells using three independent TNBC models: HBCx-6 (n = 7 tumors), HBCx-10 (n = 5 tumors), and HBCx-14 (n = 9 tumors). To avoid a bias by cells of murine origin , all mouse cells were depleted after tumor dissociation (Fig. 4a) and SSEA4-positive cells were labeled and magnetically separated from the negative fraction (Fig. 4b) before expression profiling. Transcripts with significantly increased (240 genes, p < 0.05, ≥1.5-fold, Additional file 9: Table S3) or decreased (182 genes, p < 0.05, greater than or equal to −1.5-fold, Additional file 9: Table S3) expression in SSEA4-positive compared with SSEA4-negative cells were subjected to a term enrichment analysis based on Gene Ontology categories . In the SSEA4-positive fractions, we found a strong overrepresentation of genes linked to the TGF-β and epidermal growth factor signaling pathways as well as genes involved in cell adhesion and migration and in regulation of apoptosis, proliferation, and differentiation (Additional file 9: Table S3). Among the genes upregulated across all tumor models, seven functional groups involved in cellular import and export, response to toxins and oxidative stress were significantly enriched (Additional file 9: Table S3). In particular, members of the solute carrier (SLC) and multidrug resistance ATP-binding cassette transporter families were significantly upregulated (Additional file 10: Figure S6B). Also, among the differentially expressed transcripts, we identified a substantial number of genes involved in EMT. Epithelial markers such as cytokeratin 19, CLDN1, CLDN3, and CLDN4 showed lower expression in SSEA4-positive cells, whereas mesenchymal indicators such as fibronectin, vitronectin, ZEB1, and ZEB2 were upregulated (Additional file 10: Figure S6 A). 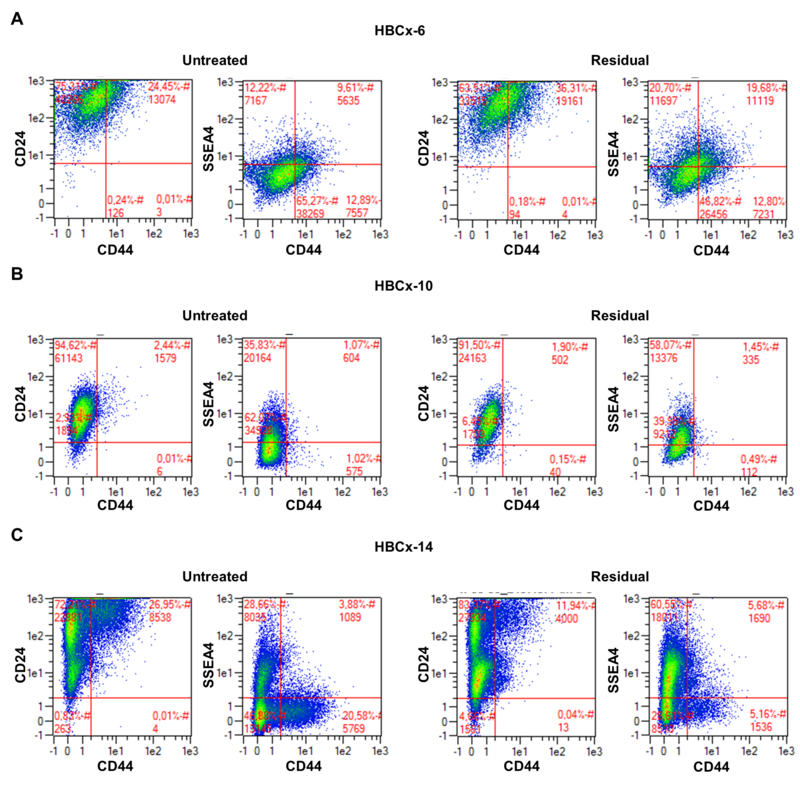 In contrast, published stem cell markers were not consistently regulated among the SSEA4-positive and SSEA4-negative cell fractions (Additional file 10: Figure S6 C). As SSEA4 is a glycolipid epitope, its expression cannot be monitored directly by transcriptome profiling. 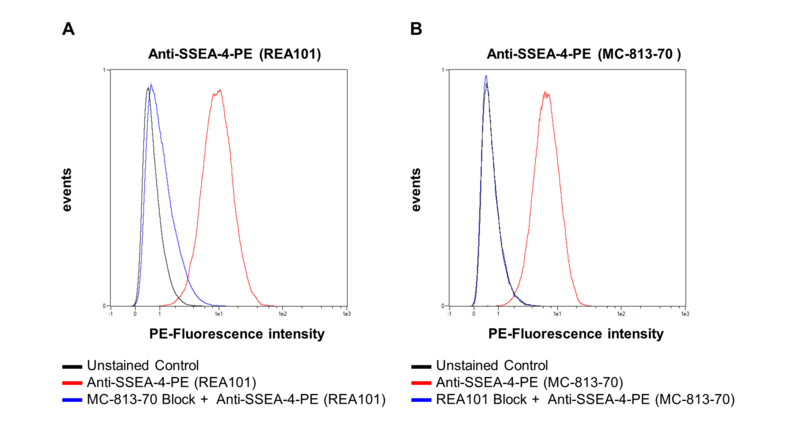 SSEA3, the direct precursor of SSEA4, showed no increased signal intensity in SSEA4-positive cells when measured with anti-SSEA3 antibody in all analyzed models (data not shown). 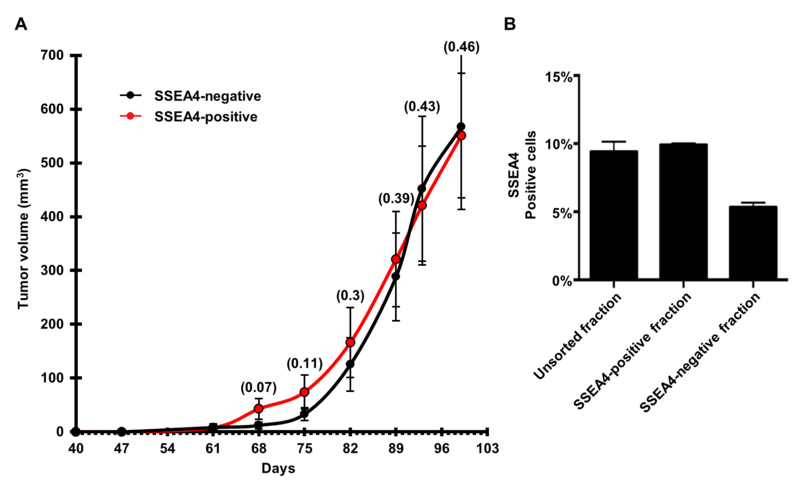 This indicates that SSEA4 enrichment regulation may be due to increased SSEA3-to-SSEA4 conversion or to increased SSEA4 catabolism in SSEA4-negative cells. However, no difference was observed in the expression of genes coding for enzymes involved in degradation of SSEA4 or of ST3GAL2, the enzyme catalyzing this final step of SSEA4 synthesis . In expression analysis of the miRNA data set, we identified 166 miRNAs more than twofold overrepresented and 68 miRNAs more than twofold underrepresented in SSEA4-positive versus SSEA4-negative cells among all analyzed tumor models (Additional file 9: Table S3). Hierarchical clustering of the Pearson correlation coefficients of our mRNA and miRNA expression datasets showed a higher correlation of SSEA4-positive versus SSEA4-negative phenotype in the miRNA rather than mRNA data set (Fig. 4c). No miRNAs were significantly upregulated, and 18 miRNAs were significantly downregulated (p < 0.05 by paired t test), in SSEA4-positive cells (Fig. 4d and Additional file 9: Table S3). These results were independently validated by using a flow cytometry–based 39-plex miRNA assay (Additional file 11: Figure S7) for direct measurement of miRNAs without prior amplification. To determine putative mRNA targets for these candidates, we used six different computational target prediction tools and considered only targets that were predicted by at least two target prediction algorithms. On the basis of this analysis, 5 of the 18 miRNAs downregulated in SSEA4-positive cells (miR-96-5p, miR-200b-3p, miR-200c-3p, miR-429, and miR-92a-3p) are predicted to target ST3GAL2, suggesting that SSEA4 expression is regulated posttranscriptionally. Furthermore, 12 of the 18 downregulated miRNAs are known to target key mesenchymal regulator and indicator genes such as ZEB1, ZEB2, fibronectin 1, Snail1, Snail2, and Twist (Additional file 12: Figure S8 and Additional file 9: Table S3). To provide functional confirmation of the role of ST3GAL2 in the regulation of SSEA4 expression in PDX samples, we knocked down ST3GAL2 by small interfering RNA (siRNA) in HBCx-39 cells, which show high levels of SSEA4 expression, and analyzed the expression of SSEA4. A significant decrease of SSEA4 expression was observed upon ST3GAL2 expression inhibition (p < 0.001, n = 6) (Fig. 5a and b). Knockdown of CD133 cell surface expression was used as a positive control for siRNA targeting, and it had no impact on SSEA4 expression. To provide further evidence of the relationship between ST3GAL2 and SSEA4, we compared ST3GAL2 mRNA levels with SSEA4 cell surface levels on nine different tumor models, which showed significant positive correlation (p < 0.002, Fig. 5c). As EMT has already been correlated with drug resistance , we wanted to examine if SSEA4 expression was increased after EMT induction. Upon treatment of the epithelial breast cell line MCF 10A with TGF-β1, almost all cells changed their morphology from an epithelial to an elongated fibroblastic shape (Fig. 6a). As expected , epithelial markers such as EpCAM and E-cadherin were downregulated, while mesenchymal markers such as vimentin and fibronectin were upregulated (Fig. 6a and data not shown). Upon EMT induction, the SSEA4-positive fraction increased more than threefold, hence proving a causal correlation between the transition toward a mesenchymal phenotype and SSEA4 expression (Fig. 6b). Given the functional connection between SSEA4 and ST3GAL2, we evaluated the clinical value of ST3GAL2 in a large, publicly available clinical microarray database of breast tumors from 2977 patients . Highly significant differences (p < 0.01) trending toward a poorer outcome for patients expressing higher levels of ST3GAL2 within the estrogen receptor–negative (ER−) or ER−/progesterone receptor–negative (PR−) subset of patients were found, independent of the treatment (Fig. 7a). When we focused on patients treated with chemotherapy, we observed a highly significant reduction of relapse-free survival independent from the tumor subtype (p < 0.01, HR 1.91) in ER− patients (p < 0.01, HR 2.97) and in ER−/PR− patients (p < 0.01, HR 3.08) among patients expressing high levels of ST3GAL2 (Fig. 7b). When we applied distant metastasis-free survival as an endpoint, we found that patients expressing high levels of ST3GAL2 had a worse outcome, confirming the involvement of SSEA4-positive cells in metastasis formation (Fig. 7c), as observed in the case of metastasis-derived PDXs. Expression of CMP-N-acetylneuraminate-β-galactosamide-α-2,3-sialyltransferase 2 (ST3GAL2) correlates with breast cancer patients’ prognosis. The predictive value of ST3GAL2 was evaluated using a large, publicly available clinical microarray database based on breast tumors from 2977 patients . Estrogen receptor–negative (ER−) patients and ER−/progesterone receptor –negative (PR−) patients displayed highly significant differences (p < 0.01) trending toward a poorer prognosis for patients expressing higher levels of ST3GAL2 (a). When we focused on patients treated with chemotherapy, we observed a highly significant reduction of relapse-free survival independent of the tumor subtype [p < 0.01, hazard ratio (HR) 1.91] in ER− patients (p < 0.01, HR 2.97) and in double-negative patients (p < 0.01, HR 3.08) among patients expressing high levels of ST3GAL2 (b). Also, when we applied distant metastasis-free survival as a primary endpoint, we found that patients treated with chemotherapy had a worse prognosis when expressing high levels of ST3GAL2 (c). To further evaluate SSEA4 expression as a marker of intrinsic tumor cell resistance to chemotherapy, we tested SSEA4 expression in samples from primary clear cell RCC, a tumor entity known to be de novo resistant to chemotherapy in more than 95 % of patients  and from late ovarian cancer, an aggressive disease whose treatment relies on chemotherapy as the only therapeutic option . Primary clear cell RCC as well as healthy kidney tissues from the same patients were analyzed for SSEA4 expression. In all of the analyzed patients (n = 3), an elevated number of SSEA4-positive cells was observed in the tumor tissue (Additional file 13: Figure S9). 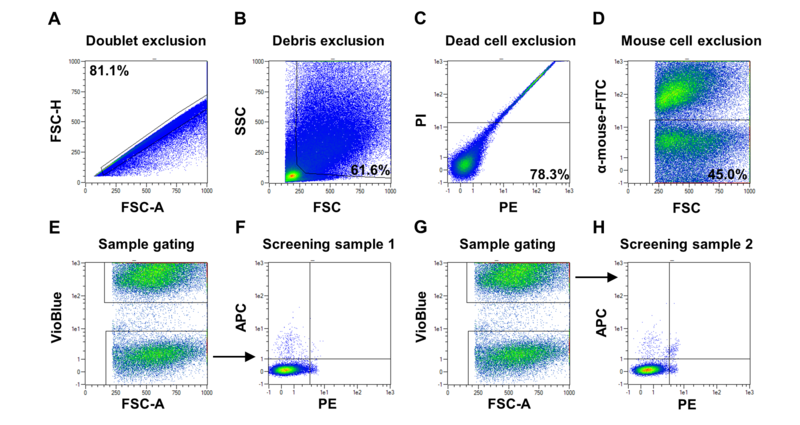 Similarly, when primary cells derived from serous ovarian carcinoma specimens were analyzed for expression of SSEA4, three of three samples from tumors that previously received genotoxic treatment showed SSEA4 expression above 10 %, whereas only one primary cell line matched to treatment-naive patients showed SSEA4 expression above 10 % (Fig. 8a–c). Analysis of mesenchyme-specific (FN1, SNAI1, ZEB2) and epithelial (CLDN3) genes by quantitative real-time polymerase chain reaction revealed that ovarian cancer primary cells with high SSEA4 expression showed higher expression of mesenchyme-specific genes and lower expression of the epithelium-specific ones (Fig. 8a and b). In light of these results, we evaluated whether ST3GAL2 expression could be associated with patient prognosis in ovarian cancer. Using the whole dataset of ovarian tumors from 1464 patients , a significant difference trending toward a worse clinical outcome was observed with respect to progression-free survival (p < 0.05) as well as postprogression survival (p < 0.05) (Fig. 8e). When we assessed patients treated with chemotherapy, the level of significance was also strongly increased for both endpoints (p < 0.01) (Fig. 8f). In the present study, we identified a novel subpopulation of chemotherapy-resistant tumor cells defined by the expression of SSEA4, the highest-order glycosphingolipid (GSL) in the globo series synthetic pathway starting from glucosylceramide. Enrichment of SSEA4-positive cells in residual tumors of all the tumor models used in this study suggests that this pluripotency marker overcomes the heterogeneity shown by many cancer stem markers analyzed (e.g., CD44, CD133, CD117, CD271, ABCG2) [27–29] that were found to be enriched only in single models. A large body of evidence indicates that upregulation of ceramide glycosylation by glucosylceramide synthase, through its ability to increase levels of high-order GSLs, contributes to acquisition of drug resistance in cancer cells . In our experimental model, the fraction of SSEA4-positive cells returned to pretreatment levels in the majority of PDXs upon tumor regrowth, indicating that this subpopulation has no general growth advantage. Indeed, this behavior was proposed for other subpopulations of drug-resistant cells . Accordingly, we did not observe a significant difference in tumorigenic capacity among SSEA4-positive or SSEA4-negative subpopulations. Similar observations have been made in non–small cell lung cancer, where residual tumor cells driving disease relapse after chemotherapy appear to be in an EMT state but do not show any enrichment of cancer stem cell marker–positive cells or enhanced tumor-initiating capacity . Given that SSEA4-positive cell enrichment is a transient event, it is possible that the SSEA4-positive and SSEA4-negative cell balance tends to revert to the original ratio of positive and negative subpopulations observed in the untreated tumor during the latency period between cell injection and macroscopic tumor growth. Tumors with initially high levels of SSEA4-positive cells seemed to be de novo resistant to chemotherapy. One important question is whether SSEA4 is upregulated during chemotherapy or if preexisting SSEA4-positive cells are selected. The four TNBC PDXs used for the antibody screening had been established from untreated tumors and received a maximum of two cycles of chemotherapy, whereas four to six cycles are administered in the clinic. This might explain why PDXs from metastatic breast cancer, as well as primary cells from ovarian cancers, previously exposed to genotoxic therapy show very high initial percentages of SSEA4-positive cells. It is possible that this difference correlates with reversible or irreversible enrichment of the SSEA4 population. Molecular analysis suggested a higher correlation of the drug resistance phenotype with the miRNA rather than the mRNA expression profile. Among mRNAs differentially expressed, a significant enrichment of genes involved in cellular import and export, response to toxins, and oxidative stress was observed, pathways that are connected to drug response at least on a global tumor level . This is consistent with the reported role of globo series GSLs in MDR1 upregulation via the activation of cSrc signaling . One striking observation was the downregulation of epithelial markers in conjunction with the overrepresentation of mesenchymal markers  at the mRNA level, and particularly, the concomitant downregulation of their regulatory miRNAs. Sustaining the observation that SSEA4-positive tumor cells show a more mesenchymal phenotype, we also found that induction of EMT enhances SSEA4 expression. This is in concordance with our observation that SSEA4 expression is found in metastatic cells that survived genotoxic chemotherapy. A large body of evidence connects EMT to drug resistance [35, 36] and metastasis [37, 38], providing a mechanistic explanation that might underlie the observed effects in SSEA4-positive tumor cells. Two of the differentially regulated miRNAs—miR-141 and miR-200a—have been shown to influence resistance to cisplatin and carboplatin in ovarian cancer by controlling the oxidative stress response . We found that SSEA4 expression also correlates with a mesenchymal state and drug resistance in ovarian cancer. 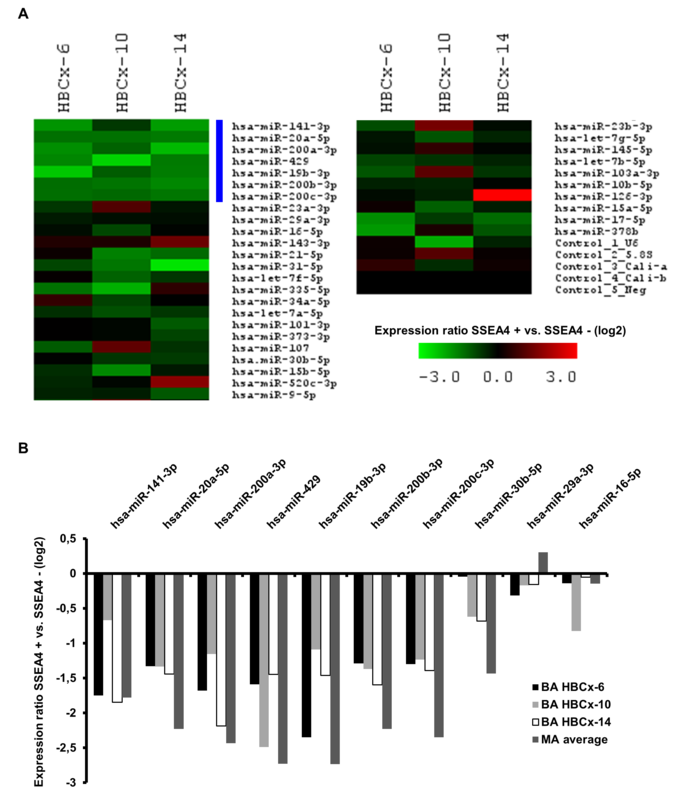 Besides the EMT phenotype, the expression of SSEA4 is also likely regulated by miRNAs among different tumor subpopulations. The direct link between ST3GAL2 and SSEA4 was proven by siRNA-mediated knockdown of ST3GAL2 resulting in a significant decrease of SSEA4 expression and by positive correlation between SSEA4 and ST3GAL2 expression in PDX models. Interestingly, all five miRNAs predicted to target ST3GAL2 are also directly involved in EMT and drug resistance [39, 40]. Even if further studies clarify whether ST3GAL2 is directly involved in drug resistance, this regulatory mechanism, in combination with the overexpression of resistance-associated genes, such as transporters of the MDR family, might be the underlying mechanisms linking EMT and drug resistance to SSEA4 expression. We have identified SSEA4 to mark a subpopulation of chemotherapy-resistant, mesenchymal breast cancer cells. Furthermore, we have shown that the expression level of ST3GAL2, the enzyme catalyzing SSEA4 synthesis, can be used as a marker to predict clinical outcome of breast and ovarian cancer patients, in particular those treated with chemotherapy. SSEA4 and ST3GAL2 may therefore represent key markers to classify patient groups in order to avoid ineffective and painful therapies and to develop alternative treatment regimens for breast cancer patients. Andrea Aloia and Evgeniya Petrova are co–first authors. Stefano Cairo and Olaf Hardt are co–senior authors. We are grateful to Jana Ciomperlik, Janina Kuhl, Nadine Chelius, Petra Kussmann, Tanja Töpfer, Jens Gaiser, Alena Böttcher, Sophie Banis, Erwan Selingue, and Vanessa Yvonnet for excellent technical assistance. Furthermore, we thank Yvonne Diener for supplying us with the CD133 siRNAs and for support in designing the knockdown experiments. In addition, we are grateful to Michail Knauel for help with the microarray data analysis. This work was supported by the Eurocancer Stem Cell Training Network (EuroCSCTraining) of the European Union (Innovative Training Networks FP7 Program; Marie Skłodowska-Curie Actions grant 264361) and by the Dietmar Hopp Foundation (to ATr). AA, ST, UB, SK, SR, BG, DA, AB, and OH are or were full-time employees of Miltenyi Biotec GmbH. EP, OD, JGJ, and SC are or were full time employees of XenTech SAS. The other authors declare that have no competing interests. AA, EP, UB, MS, SK, MRS, ATr, JGJ, AB, SC, and OH conceived and designed the experiments. AA, EP, OD, UB, MSa, FMZ, SK, SW, MR, and DA performed the experiments. AA, EP, ST, UB, OD, MSa, FMZ, SR, BG, SK, MRS, ATr, JGJ, AB, SC, and OH analyzed the data. SS, MSü, AS, ATe, MF, and LS provided crucial samples and reagents. AA, EP, AB, SC, and OH wrote the manuscript draft. All authors were involved in revising the manuscript critically for important intellectual content. All authors read and approved the final manuscript and agree to be accountable for all aspects of the work in ensuring that questions related to the accuracy or integrity of any part of the work are appropriately investigated and resolved.